This year I’ve taken a break from London to spend my Christmas and New Year in the Midlands village of Claybrooke Magna. Even though I should be concentrating on essays for University I just can’t help myself but delve in the history of the area. However, it being the holidays, I was feeling a bit too lazy to even enquire if local record offices were open. Consequently I set myself the task of finding out what I could from the comfort of an armchair. Claybrooke Magna and Claybrooke Parva, or greater and little Claybrooke are rural villages situated in the heart of the Midlands. To start my enquiry it seemed logical to start at the beginning, and one of the oldest surviving documents listing England’s settlements, the Domesday Book. 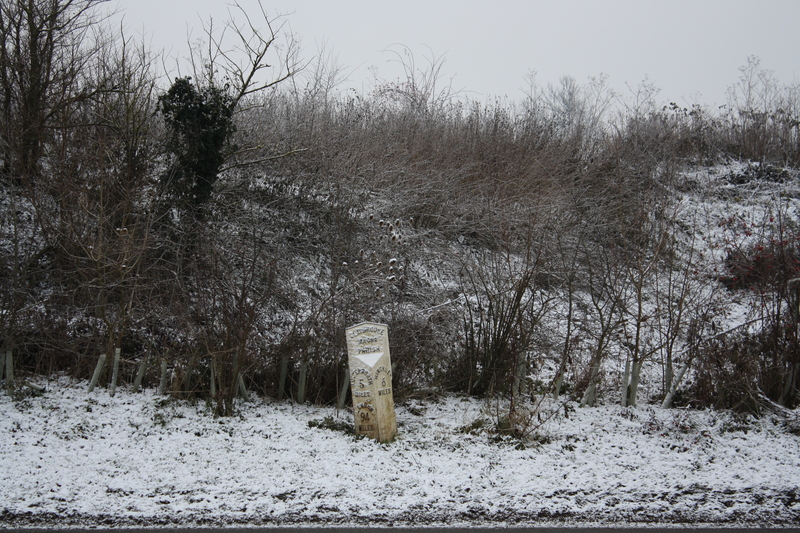 In the Domesday Book Claybrooke is listed as one village, Claibroc, and The Doomsday Book Online website notes it is ‘nearby Newcross, formerly known as Venonae, a major Roman settlement, and the junction of Watling Street and the Fosse Way’, Roman roads. 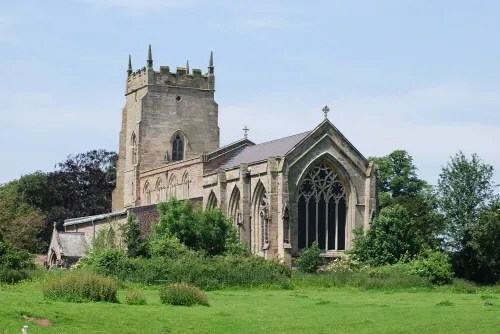 The Leicestershire History website had a bit more detail and I discovered the village was held by Fulk, one of the Count of Meulan’s men (whoever the Count of Meulan was?!). He held one plough and 2 slaves. The village had a modest population of 9 freemen, 9 villagers, 2 men at arms and 6 smallholders with 5 ploughs, and had a value of 55 shillings. My next line of enquiry took me to the Heritage Gateway website and I was surprised and the amount of listed buildings in the Claybrooke area, 7 in Claybrooke Magna and 4 in Claybrooke Parva. The oldest building is St Peter’s Church in Claybrooke Parva, which possibly dates back to Anglo-Saxon times with many additions and modifications over the years and today stands majestically in the centre of the littler Claybrooke. I couldn’t find much in the way of history in the time between the middle ages and eighteenth century, but Wikipedia turned up an interesting story about some of the ministers of St Peter’s, who had a surprisingly far reach. John Higginson was minister of Claybrooke from 1571 and is also listed as one of the 8 ‘founding fellows’ of Jesus College, Oxford. His son, Francis Higginson became the minister at St Peter’s in 1615 after he had obtained a BA and MA at Jesus College, Cambridge, and became renowned as a preacher. The Oxford Dictionary of National Biography details that at some point Higginson became acquainted with Arthur Hildersham, a well-known non-conformist, and subsequently became disillusioned with the Church of England. In 1627 Higginson lost his license and in 1628 proceedings in the Court of High Commission had begun. This led to Higginson’s application to the Massachusetts Bay Company to be a Puritan minister in one of the new settlements in New England. His application was successful and he sailed with his family from Gravesend in April 1629, eventually landing in Salem, Massachusetts. His place in history was firmly established when his account of his journey, A True Relation of the Last Voyage to New England, was published in the nineteenth century. The majority of key buildings in Claybrooke appear to have been built in the eighteenth century, which include the Water Mill in Claybrooke Magna which is still in working order today. Could this be as the Industrial Revolution coming to Claybrooke? In any case it is clear that the area at this time was growing and with the nineteenth century came the railway boom, and in 1840 a Midland Counties Railway opened a line from Rugby to Derby and Nottingham, with the aim of providing Leicester with Nottingham coal. The service also stopped at Ullesthorpe, a town close to Claybrooke. The route from Leicester to Rugby was closed in 1961, and the tracks now lie overgrown. 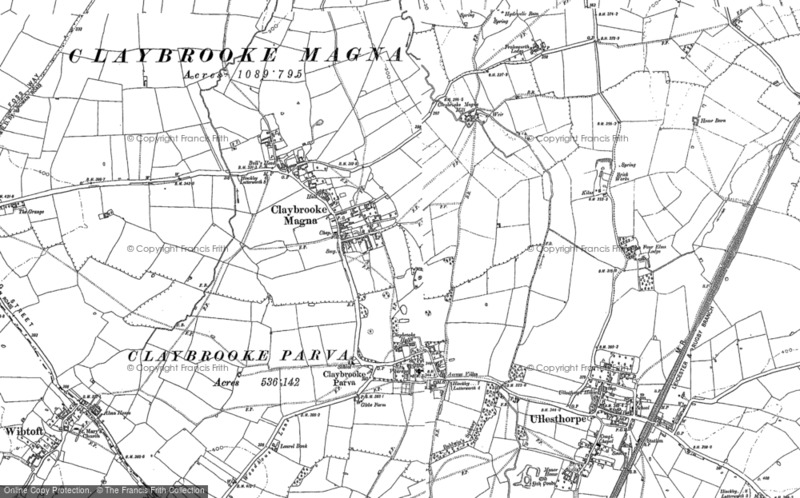 The parish of Claybrooke is mentioned in the Topographical Dictionary of England on the British History Online website. This was published in 1848 and details the population of Greater Claybrooke as 514 and Little Claybrooke as 104. The main industry of the area is given as ‘stocking manufacture’, unsurprising as the Midlands had become a centre for the knitting industry during the Industrial Revolution. There are two schools in the parish, the most recent a school for girls set up by a J.E. Dicey Esq. The Dicey family‘s link to the area appears to date back to 1765 when the printer Cluer Dicey bought Claybrooke Hall, now another listed building in Claybrooke Parva. The Dicey’s left the Midlands in 1848, but did not sell the Hall until 1885. 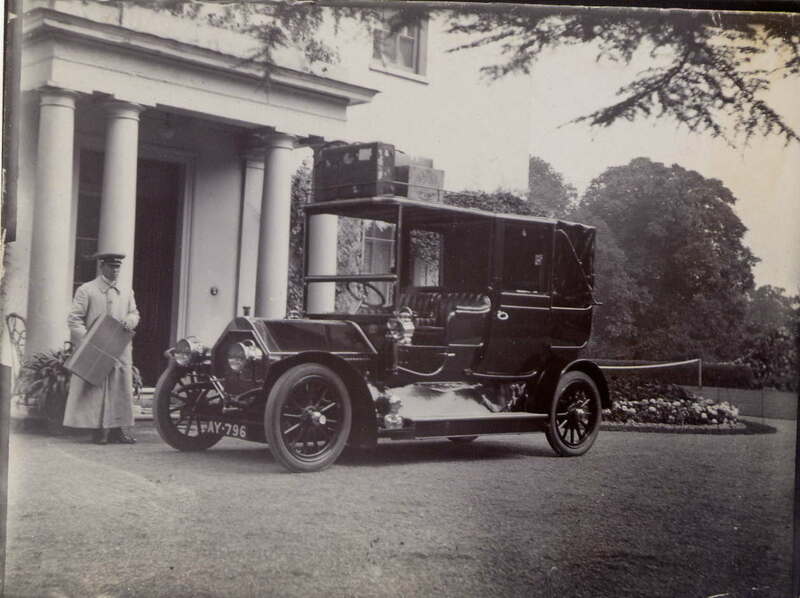 The Humphries family history website where I found this information also had this lovely picture (above) of Claybrooke Hall in the early twentieth century. A website dedicated to the Claybrookes has the best information on the area in the twentieth century, with a link to an amazing scrapbook and memoirs donated from a local resident. The photos are amazing with many portraits of friends and family as well as beautiful images of a lost agricultural life. Another notable feature of the photos are the amount of men in uniform, a stark reminder the two World Wars and the affect they must have had on these small villages. St Peter’s has a war memorial for all those lost, and the Claybrookes website has an in-depth article on the memorial, it details who the men were, and where they fought and died, it also includes some of the soldiers correspondences with loved ones whilst in service. The 1960s saw the building of many new homes in Claybrooke and the recent times have seen the refurbishment of the listed buildings including the Claybrooke Mill and Claybrooke Hall, however as with many rural towns many of the local amenities like the village shop and post office have closed. Though the area is still popular and if the Claybrookes website is anything to go by, they still have a thriving community. This is obviously a very brief history, but still an interesting one, and Claybrooke is definitely a place I would love to find out more about. In my time here I have also come across a couple of documents mentioning a robbery of Church linen in 1507 and nearby villages using Claybrooke’s common land before it was enclosed in 1694. Areas that definitely deserve further research, but perhaps in a records office or library rather than an armchair…. I hope you’ve also found this interesting and if anyone has any more interesting information on the Claybrookes history, or have comes across a copy of Rev. Aulay Macaulay’s The history and antiquities of Claybrook, in the county of Leicester (Northampton, 1791), I’d love to hear about it! Thanks for the comment, and glad you liked my piece. Wow, sounds like you have quite a history with Claybrooke Magna. My link is through my boyfriend, his family live there now. It really is a lovely part of the world. Please do let me know if you find anything interesting about its past. Good luck with the research. hello my name is Danielle Claybrook i am seeing if there is any chance to the people who started this town i really need help but i think we maybe because my father told me there is a town, castle, and manor conected with our family. Please help!!!!! So sorry it’s taken me so long to get back to you – I’m currently finishing off an MA. I don’t think there was a family called Claybrook directly linked to the village, but once I’ve handed my dissertation (in the net couple of weeks) I’ll try and do a bit of digging for you and see what I can find! Again apologies – I take over a month to get back to you to say I don’t know! But will see if I can be a bit more helpful soon. Thanks for the comment and visiting my site btw! Thank you for your article on Claybrooke. My great-great grandmother Ann Hall, daughter of Timothy Hall and Ann Palmer, was baptized in Claybrooke in 1813. Some of her siblings remained in Claybrooke. Her father and brothers were bricklayers. When I see photos of brick homes in Claybrooke, it makes me wonder if a Hall laid the bricks! There were still 4 Hall households in Claybrooke in 1911. Thanks for the comment, and glad you liked the post. Fascinating to learn a bit about your family history! I wonder how many of the 4 houses from 1911 are still there, all hopefully! Suppose that’s an advantage to having bricklaying ancestors, is the possibility of being able to appreciate the fruits of their labour today! Good luck with the rest of your family research. I love your article on Claybrooke. I’d been investigating the Manger family who came from Lutterworth, but the original ‘Manger” in the area was a ‘foundling baby’ apparently found in a manger in Claybrooke Magna in 1720 and a parish priest took him in. On a couple of websites it says the hall was the only place with a barn. I’m definitely interested to find out who the family living in the hall at the time was. Maybe one day when I visit the UK again. Good luck in your research. I wonder how many records would be kept for that baby. Sounds like your’ve made some amazing discoveries and would be great to hear more about your research. Best of luck with it all, and thanks for the lovely comment. Hi Kathleen, I read your article on Claybrooke. It is excellent. I was born in Claybrooke in 1951 my name is Carol Roberts (nee Batchelor) I have recently opened a facebook group called Old pictures of Claybrooke Magna Claybrooke Parva and Ullesthorpe the link is https://www.facebook.com/groups/428070670565727/ if your interested. I started the group about 3 weeks ago with 6 or so members and now we have over 150 and growing. There are some interesting contributions about Coltman Bros. and A History of Claybrooke Magna and Claybrooke Parva as Mrs. Laura, Mary Benford (nee Coltman) knew it in the days of her childhood from 1916 onwards. What is the name of your partners family from Claybrooke, perhaps they are in the group or would like to join. Hope this is of some interest. A had one plough and 2 slaves, now we need to know if these were male or female slaves, as female slaves of childbearing age were worth more than male ones. Hi. I have a copy of Macaulay’s book. If i find time i could scan or photocopy it. If you google John Garrett Claybrook you can find references to his birth in Claybrook township, Leicester, England in 1579. I know that certain members of the Claybrook family can supposedly trace their lineage back to this individual. While evidence is thin, I believe there is a chance that individuals with the Claybrook surname lived in the area in the middle ages. It would take some time and knowledge of British geneology to attempt to verify. I came here because one of my ancestors who was born there in the late 16th century moved to Massachusetts (Essex County) during the “Great Migration” of Puritans after her marriage to John Tilton (who probably developed his views at Oxford or Cambridge or was otherwise under the influence of a minister who had adopted Calvinism after a more conventional beginning). Her name was Susannah Morreal (or Morrell). Reading here about a Higginson (a very prominent name in Massachusetts history), my ears perked up. Although it is a very small town, it sounds like it went through a very intense period, possibly of religious conversion, and as was mentioned, it had quite an effect on Jesus College. I wondered why a few generations later, one of my uncles was called (as his Christian name) “Dudley”. Since that is a family name too in Massachusetts, associated with the elite family in England, and since that family is associated with Warwick, I think there is some connection. In the early 18th century, in the place where Uncle Dudley was born, you did not casually name some child because the sound of a name appealed to you, not when there were Dudley’s walking around who were quite proud of it. So I suspect that Susannah, his grandmother, or other family members from the area (Tilton’s?) wanted to remember the connection.